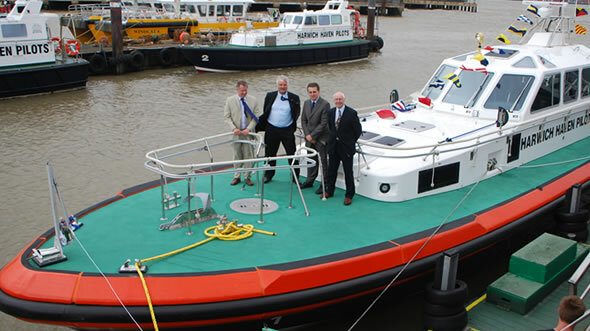 Representatives from Holyhead Marine had the pleasure recently of attending the official naming ceremony for the first Pilot Boat delivered to Harwich Haven Authority last month. The ceremony was attended by representatives of Harwich Haven Authority, guests were welcomed by Stephen Bracewell the Chief Executive before the craft was blessed by Rev. Peter Mann then finally named by Ms Jill Gibbs. The newly named St Brendan will now start its work at Harwich and we wish its new owners the very best with their new boat. The vessel is the first of two to be built for the Authority the second of which is due to start mid October.